KQED Science answered your questions in a Facebook Q&A with Ben Burress, a staff astronomer at the Chabot Space & Science Center. Updated Tuesday, January 30, 2018, 12:30 p.m. The rare lunar treat begins after midnight tonight, when you can see a blue moon, a super moon, and a total lunar eclipse – what some people are calling the "super blue blood moon." A blue moon is the second full moon in a month, while a super moon is when the moon looks especially large and bright due to its close proximity to Earth at that time. A total lunar eclipse – what some call a blood moon for its reddish tinge – is when the moon becomes completely cloaked as it passes through Earth's shadow. The last time this rare trio occurred was in 1982 and it won't happen again until 2037. The Chabot Space & Science Center will open its observatory deck with telescopes at 3 a.m. for the special viewing. NASA will live stream the super blue blood moon and total eclipse starting at 2:30 a.m. Pacific. The full moon rises tonight as the sun sets, at 4:53 on the West Coast. 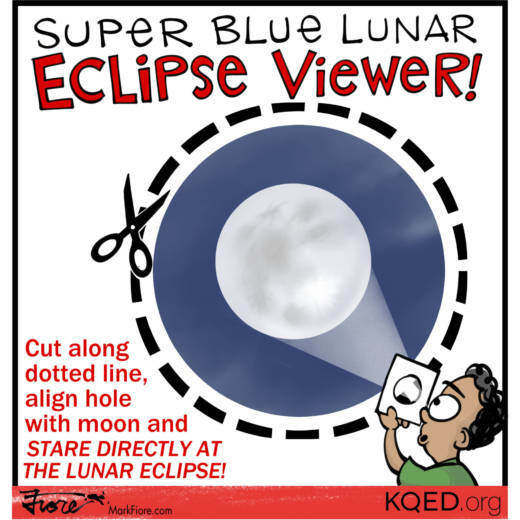 You'll be able to see the full, blue, and super moon all night long. The lunar eclipse begins at 3:48 a.m., with a total eclipse beginning at 4:51 a.m. and lasting until 6:08. In the United States, the western half of the U.S. and Canada will have the greatest visibility of the eclipse while the East Coast will miss out since the moon will be setting just as the eclipse begins. Have questions about the special lunar event? KQED will host a live Facebook Q&A session at 1:30 p.m. today with Ben Burress, a staff astronomer at the Chabot Space & Science Center. On January 31st, we will be rewarded with a winning spin in the celestial jackpot machine. On this day the full moon is also a super moon, a blue moon, and, oh, yes, a total lunar eclipse! The full moon happens every month, of course. Even so, it's still a beautiful thing to see. With the moon at the opposite end of the sky from the sun, we see its fully sunlit face, without a hint of the shadow of lunar night. Full moon is bright, reflecting pale sunlight onto the nighttime world around you. 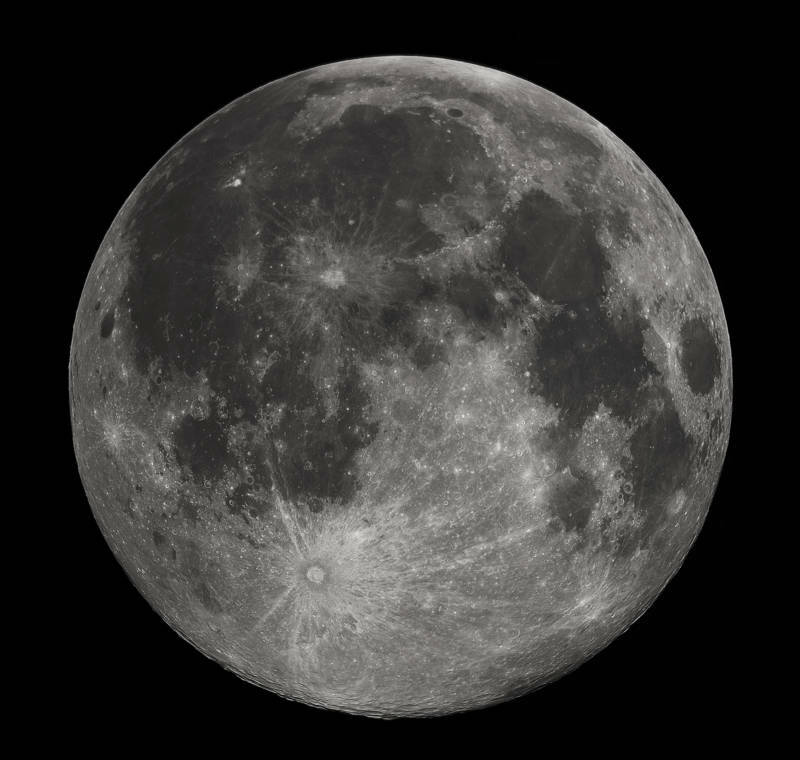 In addition to being fully lit, the full moon on January 31 will be a super moon, slightly larger and notably brighter than a garden-variety full moon because it is near its closest approach to Earth. The moon orbits the Earth on an elliptical path, with Earth closer to one of the ellipse's ends. 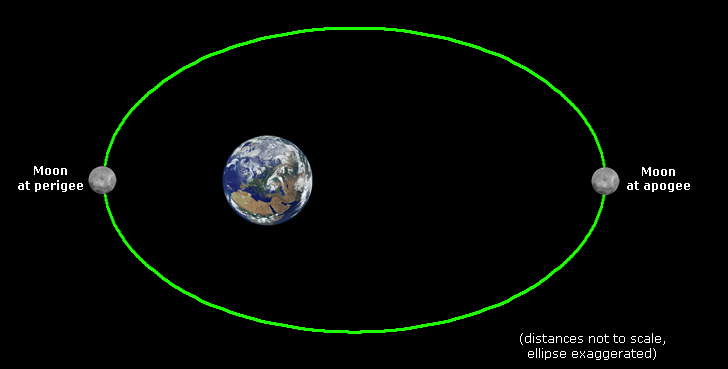 Over the course of one lunar orbit, the distance between Earth and moon changes continually, going from closest (perigee) at one end of the ellipse to farthest (apogee) at the other end. 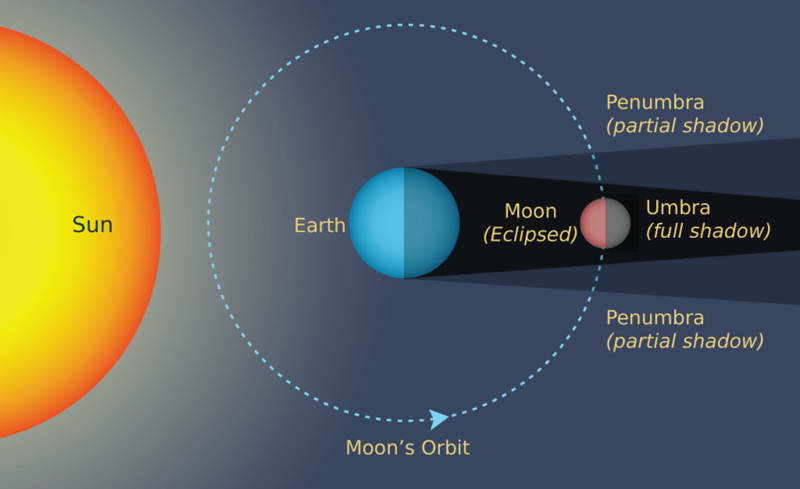 Though the moon passes through perigee with every orbit, it is far less common for perigee to coincide with the full moon phase, when the moon is on the opposite side of Earth from the sun. But when perigee does coincide with full moon (or new moon, for that matter), it is called a super moon. The term was coined in 1979, and defined as any full moon (or new moon) that is within 90 percent of its perigee distance. A super moon appears about 14 percent larger than the full moon at apogee (its farthest distance). Judging the apparent size of the full moon when it is closest and farthest isn't easy, since we can't compare the difference at the same time. If you set a penny and a nickel side by side, it's easy to see the difference in their sizes, but try holding up a penny right now, then tomorrow hold up a nickel to compare the two coins' sizes—not as easy! The difference in size between a penny and a nickel is roughly that of the full moon at apogee and perigee—not a huge difference, but notable if you compare photographs of the two. In fact, the famous "Moon Illusion," the perceptual effect we experience when the moon appears much larger near the horizon than it does high in the sky, is greater than the physical apogee/perigee difference. The bigger effect of super moon is in the moon's brightness. 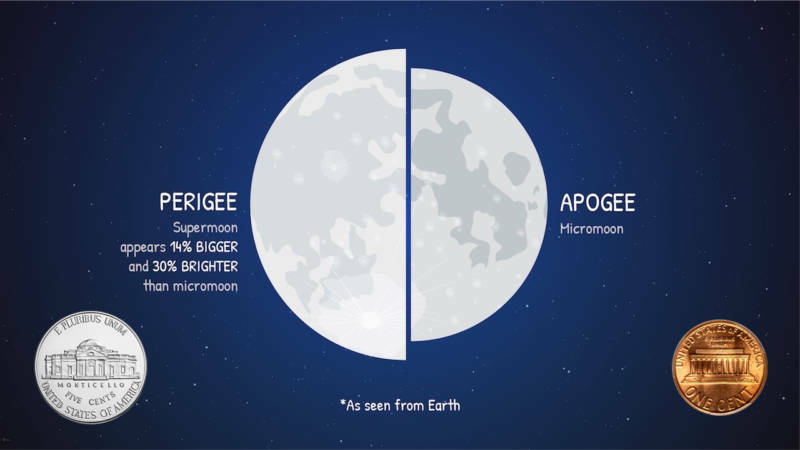 The perigee full moon is about 30 percent brighter than the apogee full moon. That's almost like turning up the dimmer on a light bulb from two-third to full brightness. So, the super moon, and the landscape it illuminates, will be that much brighter. Yes, the cosmic jackpot tumblers turned up a blue moon this time too. No, it doesn't mean the moon will appear blue (at least, no bluer than usual). What it does mean—at least in modern popular culture—is any second full moon occurring in the same calendar month. So, we call the full moon of January 31st a blue moon because there was also full moon on January 1st. Perhaps the biggest headliner, or the luckiest jackpot tumbler, of this night is the total lunar eclipse—a sight, if conditions permit you to see it, that will blow away any full moon, even super ones, or even any that might appear blue…. During this full moon, the sun, Earth, and moon are lined up almost perfectly, and the moon will pass right through Earth's shadow. The moon first enters Earth's "penumbral" (partial) shadow at 2:51 AM PST, though the shadow's appearance is subtle and you may not notice it. If you're planning to get up early to see this eclipse, my advice is to stay in bed a bit longer, and get up to see the beginning of the partial eclipse, when the moon enters Earth's "umbral," or full, shadow. Partial eclipse begins at 3:48 AM (I know, it's still early, but you got almost an extra hour of sleep!). Now, you should begin to see one edge of the full moon darken a bit, as if a tiny piece of a cookie has been nibbled away. Then it only gets better, the umbral shadow growing until finally it covers the entire moon, and "totality" begins. Totality begins at 4:51 a.m., and lasts until 6:08 a.m. PST. During this time, the moon, fully engulfed in the Earth's umbral shadow, will darken considerably, and may acquire a dim orange or rusty red hue. Red? I thought tonight's moon was Blue…. The orange/red coloration you may see is caused by Earth's atmosphere. Though the moon is fully within Earth's shadow, with no direct sunlight falling on it, some sunlight passing through Earth's atmosphere is refracted, or bent, and directed into Earth's umbra—so the moon doesn't go completely dark. The light is red because Earth's atmosphere filters out the sunlight's bluer colors, and lets the redder tones pass through, like a piece of red colored glass. You see the same effect at sunrise or sunset, when the sun may turn to orange or reddish hues. If you were on the moon looking back at the Earth during totality, you would see the dark silhouette of the Earth rimmed by a ring of orange and red—literally the light of all the sunrises and sunsets happening on Earth at that moment. Following the end of totality (6:08 AM), the partial eclipse will continue until 7:11 AM—shortly before moonset at 7:19. So, if the tumblers will align in such lucky fashion on January 31st, is this a good time to buy a Lotto ticket?